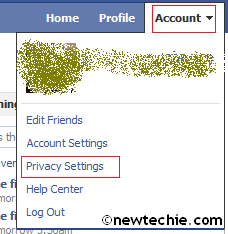 How to Hide Facebook Profile from Facebook & Search Engines? Lets check out in this post, How anyone can restrict his/her Facebook Profile from appearing in Search Results of major Search Engines like Google, Yahoo! and Bing as well as in inbuilt Facebook Public Search? Note: Search Engines may take somedays to remove your Facebook Profile from their Search Results completely. 1. Log in your Facebook Account. This will Hide your Facebook Profile from appearing in the Facebook Public Search instantly! Although your friends will continue to get your profile in the Search Result, when they search for you on Facebook.